THE TEERITZ AGENDA: Friday 28/10/16 & Saturday 29/10/2016 - Work's Busy, "The Night Manager" is Awesome, So Is My Tower Chieftain III & This Week's Wristwatches. Friday 28/10/16 & Saturday 29/10/2016 - Work's Busy, "The Night Manager" is Awesome, So Is My Tower Chieftain III & This Week's Wristwatches. I've been flat-out at work since I got back from my holiday almost a month ago. I think it'll take me another week or so to get back up to speed. Been slowly working through a post about the first leg of the trip, and sorting through the photos is a bigger job than I thought it would be. Hopefully, this post will be done in a week or two. Preparing to thin out some of the stuff I've accumulated over the years. eBay, here I come. I currently have a Tower Chieftain II being repaired by Tom The Legend. He called me on Wednesday to say it was ready for collection. Once I get it home, I'll put it through its paces and if I'm happy with it, I will get rid of my Smith-Corona Skyriter. Time to get the typewriter collection down to a manageable amount. Same with the wristwatches. I have a few that rarely get worn, and I have my eye on another one, so it's time to move some along. My Tissot Visodate was on the chopping block for a while, but lucky for it, I can't find its box. Besides, this watch is a bit of a sentimental favourite because of the ridiculous page-view count of the review that I wrote six years ago. So, I think I'll put it aside to give to my son when he turns eighteen in a (wow!) couple of years. He's currently wearing one of my Seiko dive watches. I will get him his own Seiko for Christmas (his birthday!). He started shaving recently. I showed him the ropes and I think I might supervise him a few more times until he gets the hang of it. He's using a cheap razor that I got for him off the 'bay. Reason being that I still have about 140 Schick Super II blades that my Dad purchased back in the early '80s before he switched over to a Phillishave electric. One hundred and forty razor blades should last my son until he's thirty. Well, not quite, but it is a tonne of blades. Wristwatch-wise, I began the week with the Omega Seamaster Chronometer from 1969, seen here with the last Lucky Strike from that pack. Cigarettes are too damn cheap in France. Don't go there if you're trying to quit. Now there's a travel tip you won't find in a Lonely Planet Guide. Unless it's written by Mickey Rourke. 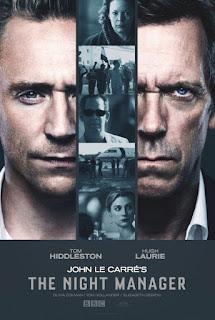 Started watching the brilliant six-part mini-series The Night Manager, which is based on a John Le Carre novel. 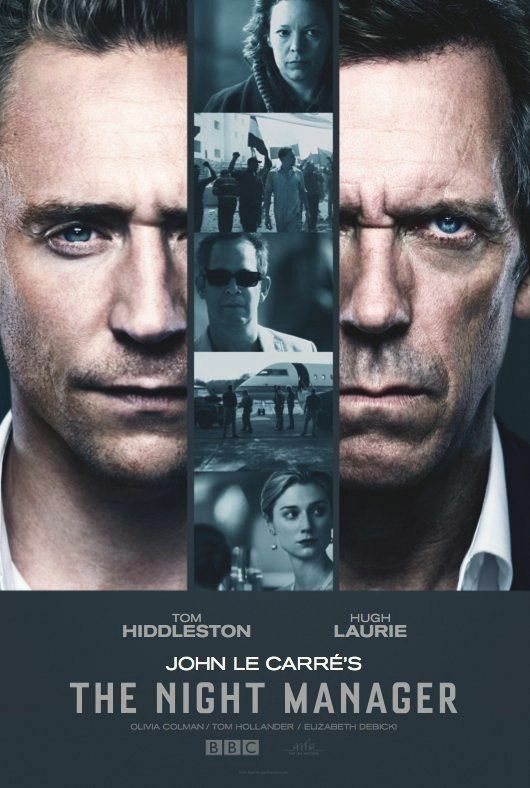 It concerns an ex-military man, played by Tom Hiddleston who offers himself as a recruit to a small branch of British Intelligence to infiltrate the inner sanctum of a billionaire industrialist, beautifully played by Hugh Laurie, whom they suspect of supplying arms to Middle Eastern terror networks. This series is impressive, to say the least. Director Susan Bier honours Le Carre's world of shady dealings, duplicitous intelligence chiefs, and multi-layered storylines as we watch Jonathan Pine (Hiddleston) go from hotel manager to man of vengeance as he plays a long game to try and bring Richard Roper (Laurie) and his empire down. After the first episode, I thought to myself; There's the next Bond film director. In a perfect world, that is. I would love to see a OO7 adventure given a woman's touch. And speaking of OO7, Hiddleston has made no secret of the fact that he'd love to play Bond. When I first heard this a few months ago, I thought that he'd make a pretty good Bond, despite some fans that I know saying otherwise. By the end of the second episode, I wasn't so sure he'd be right for the role. I changed my mind slightly by the time I'd gotten through episode four. Sure, he lacks Daniel Craig's brutish menace, but he appears to be the right fit for a Bond at this point in time. He is the Bond for the Millennials, the hipster crowd, the iGeneration. The Bond films, if nothing else, have always reflected the zeitgeist. The campy 1970s gave us Roger Moore's Carry-On Bond, the '90s delivered Pierce Brosnan's supermodel glamour-boy OO7, and the serious, post 9/11 Noughties brought along Daniel Craig's gritty, back-to-his-roots Bond. We are now heading towards the cusp of a new Bond, even though Craig may do one or two more, and I seem to think that Hiddleston might just be good for the job. As for Hugh Laurie, if you've only ever seen him in the eight-season TV series House, then his performance in this show will surprise you. He comes across as charming and sincere in his early scenes before we begin to get a fuller picture of his true nature. The rest of the supporting cast is wonderful, with special mention going to Olivia Colman as Angela Burr, the head of the small intelligence unit running Pine, who has a particular jones for wanting to bring Roper down, and Tom Hollander as 'Corky' Corcoran, Roper's right-hand man, whose every gay double-entendre is laced with menace. But let's face it, there's no such thing as a bad English actor. You put any Brit who has done Shakespeare on stage into a film and you can't go wrong. Alan Rickman in Die Hard is one example. Patrick Stewart in Star Trek: The Next Generation is another. Kudos, too, to Australian actress Elizabeth Debicki as Jed Marshall, Roper's girlfriend. Debicki more than holds her own alongside this fine cast. She was extremely watchable in Baz Lurhmann's version of The Great Gatsby a few years ago. She may just go very far indeed. The cinematography is divine, too. Especially the scenes set at Roper's villa in Majorca. I can pretty much not find anything bad to say about this series so far. I have one episode left to go, and yet I'm here writing this blog post. What the hell??!!! 'Scuse me. The Night Manager was awesome! The final two episodes gave me a slight Hitchcock's Notorious vibe, but this is a minor quibble. There were some tense moments throughout. Well worth catching it if you get the chance. The Sears Tower Chieftain III has a nicer action than my Skyriter. Probably due to it being a slightly newer machine, perhaps. My main grip with the Skyriter that I have is that it's the first generation model, which has the metal case cover and therefore has the short carriage return lever. Aside from that, it's an okay machine, but this Tower has the edge over it. I bought a couple of battery adapters off eBay so that I could use regular LR44 batteries in my circa 1968 Nikon F. Since the demise of 1.55volt mercury battery production, alkaline batteries have been used in the built-in light meters of old 35mm SLR cameras, but this has meant that the light meters give off a slightly different reading due to the difference in voltage of Alkaline batteries. This can result in photos turning out under or over-exposed. These adapters are meant to mimic the design of the old mercury batteries and can be used with normal 1.5v Eveready or Duracell batteries, which can now sit properly in the battery bay of these older cameras. My explanation isn't quite right, and correct photographic technique will require you to set your f-stop higher or lower depending on lighting conditions. Man, I'm rusty on my photographic knowledge. It was never stellar to begin with. Anyway, I'm looking forward to running some film through this classic camera and seeing the results. David Bowie died in January this year and it still hurts. I set this photo up on a recent issue of Uncut magazine, which contained an article on an unreleased Bowie album which may never see the light of day. I did fish out the Rolex Submariner and considered wearing it for a few days. Although, I'm a little reluctant to wear this watch out of the house until I get it serviced. It needs some attention. Something that I'll tackle sometime in the next few months. In the meantime, I've been quietly squirreling away my loose change and the odd five or ten dollar note here and there for quite some time and I'm now close to snagging another wristwatch. Firstly, though, I'll take another long, hard look at what I have, in order to determine what gets worn and what I may do without. I'm not anticipating a huge cull by any means, but I just might thin things down a little more. Besides, whatever I sell will go towards topping up my "Money Box" bank account which is designed for frivolous purchases. And that's another week down. This cold that I picked up in Italy is receding slowly. My wife still has it, but she too seems to be on the mend. Maybe a few more days and we'll both be back to normal. I enjoyed this update. I can relate to your desire to downsize the typewriter collection, I've been doing the same. Fewer machines but higher quality. Thanks, Joe. Yes, the typewriters take up quite a bit of room in the very small spare bedroom. I've now reached a point where I know what kind of typewriter I like to use and therefore, anything that doesn't measure up, for me anyway, should be moved along. Having said that, some machines that don't type so great are being kept because they look so nice. Yes. I'm weak. Thanks, Ted. I'm beginning to think that the Black Plague lasted less time than this cold. It's been a month, now. And yeah, this Tower is a very nice machine. The mid-50s, Atomic Age font used for the name on the ribbon cover is really neat. Types real nice, too. Keeping this one. I just removed my previous comment because autocorrect spelled your name wrong, and I hate it when that happens. I still have the Visodate, Stijn. I wear it from time to time, but it's 40mm case size has always looked a little large on my wrist. In recent years, I've reverted back to my preference for smaller sized dress watches, so I've been wearing my vintage watches more, whenever I've felt like wearing something dressy. With a wrist size of 6.5 inches, and having collected watches for so long, I have a much better sense these days of what kind of collector I am and I prefer my dress watches to be 38mm in diameter at the most. If the Visodate were about 3mm smaller, I'd be wearing the hell out of it. Still, whenever I do wear it, I'm reminded of why I bought it to begin with. It is a modern classic and it definitely has been a successful model for Tissot. I hope your one still makes you smile. No worries, that happens all the time. It's a name only popular in the Dutch speaking part of Europe. it's actually the equivalent of Stan (and pronounced exactly the same). Truth be told, I still haven't bought it yet! :) After years of not wearing a watch anymore, I bought a Tissot Couturier Chronograph some six years ago. While I of course should have bought the Visodate, which I only discovered shortly after. Since than I also bought a Orient Black Mako as a daily beater/beach watch and felt that a third watch would be a bit too much (I would have to buy a watch winder etc and when will I wear them all?). Moreover, I have been in doubt between the Visodate and the Hamilton Intra-matic. While I like the nostalgic look of the Visodate, the latter has an even cleaner design and nice long hands (those of the Visodate are a bit short). All this made me doubt and doubt for years, but having seen a Visodate again recently I can no withstand it and will be buying it within the next couple of days. The Couturier Chrono is a well made watch. Large for my wrists, but a lot of watch for the money. Orient Mako is great value too. I was tempted to get one once, but my dive watch dance card is pretty full, and I'm kind'a more partial to Seiko Dive watches. The Hamilton Intramatic is a knockout. Very nice iteration. Very "Mad Men". Another watch that I've been tempted by. Nothing wrong with having a small collection of watches. Four to six is a good, controllable number. That should cover any occasion, outfit or mood. And yes, always have a beater in the collection. They come in handy. The first scratch always makes it truly yours.